The new Urban Alternatives House on Eddy Street in Flint. The saga of the Urban Alternatives House continues, but this time there's some good news. If you remember, the project originally involved restoring an abandoned house at 519 Garland Street in Carriage Town with funding from the Genesee County Land Bank, federal neighborhood stabilization grants, and UM-Flint. The goal was to create classroom space for university students, the community and visiting school children, according to the project website. The house would maximize energy efficiency and introduce sustainable, innovative ways to manage energy and water use. In the lot adjacent to the house a vegetable garden would be planted to encourage more active and healthy living and provide a demonstration site for urban agriculture. The original home of the Urban Alternatives House (left) and the partially restored Jackson Hardy House (right) on Garland Street in Carriage Town. "Special programs geared for K-12 students will be presented at the UAH," said UM-Flint Associate Professor Richard Hill-Rowley. "The focus of these programs will be on the science aspects of energy use and conservation. A premise behind these programs is the need to introduce ideas about climate change to these students and use the site to explore ideas of sustainability, walkable communities, and locally grown food." 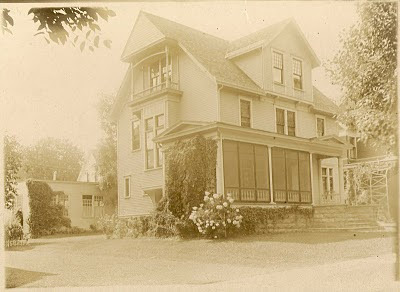 The house at 519 Garland Street around 1900. 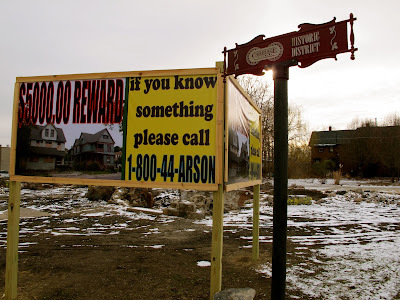 But the arson spree that swept through Flint in 2010 undid all the hard work that had gone into the project when both the UAH and the Jackson Hardy House were destroyed by fire. 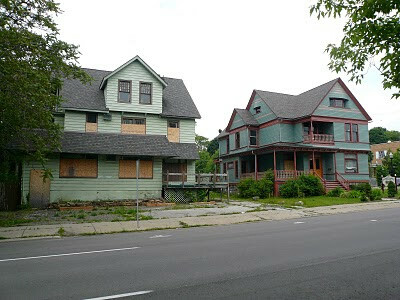 This empty block was home to the planned Urban Alternatives House and the Jackson Hardy House. The empty lot next to the brick house in the background to the right is the former site of Third Avenue Fish and Chips. Now, Professor Hill-Rowley has a new location and additional funding for the Urban Alternatives House on Eddy Street, near the old Central High School. “We sort of regrouped for a while and we had a lot of community support and I was anxious to see if we could still continue with the idea,” he said. “And this house was available through the (Genesee County) Land Bank and so it’s a different place. It’s a little further away from campus, but not that much. The objective of the program is to teach sustainable and green living, support environmentally friendly renovations for Genesee County Land Bank Properties and promote neighborhood stability. The total development cost is $429,840. Two-thirds of the funding for the project comes from the land bank, with another third coming from the university via foundations. “The house is still owned by the land bank and we are leasing the space. Because it’s federal funding, they have rules about the way they can lease the house,” Hill-Rowley said. Gordon, you might be interested in seeing this video. Michigan as a whole looks awesome, and Flint itself has probably the best scene in the whole thing! I know that this funding couldn't be used for just anything, and you take the funding you can get, but that's an awful lot of cash to spend on one house. One person's nearly-half-million-dollar renovation of a very old frame residential building to provide a space for teaching energy use and conservation, climate change, sustainability, walkable communities and locally grown food...subjects that by their very nature wouldn't have nearly the impact if taught in a conventionally built academic institutional space...is another person's 2/3-taxpayer-funded boondoggle. Well, this project makes me very happy every time I go by it. I've been walking by that old house for years and mourning its gradual deterioration - one could see that once upon a time it must have had some elegance. I love the love that's going into it -- an argument in opposition to the crumbling Central High School right across the street. It's a relief to see something being restored with both sustainability and style. "I love the love that's going into it -- an argument in opposition to the crumbling Central High School right across the street." The technical folks says that Central was abandoned because bringing it up to code and making it economically sustainable as an institutional facility would have cost more money than could be obtained. Foundations can spend their money as they see fit, but the U.A. House project will be 2/3 funded by taxpayers...which ultimately is to say, with funds borrowed from the Saudis and the Chinese, and the U.S.'s other bond customers...who will expect our children to pay them back with interest. So, it's hardly free money. "It's a relief to see something being restored with both sustainability and style." I love style, and I love old houses. I don't understand calling an old wood-framed house being re-purposed for public institutional use "sustainable", though, and I wonder how much more per square foot of teaching space this building will cost to rebuild and lovingly sustain over say a twenty year institutional life, compared to boring, cost-effective school-building architectural styles. Three times as much? Five times? And of course that half million of renovation costs quite possibly could have been have gone toward fixing things that are broken or code-noncompliant in existing FBOE properties. Rhetorical questions, of course. I'm sure it'll be nice when it's done. To JWilly and your rhetorical questions, I confess I am not a pragmatic person when it comes to the costs of transformation. I'm a writer, a poet, and things take on metaphorical significance to me that bore into my brain and bother me: they aren't measurable in dollars -- I'm not saying this is a good thing -- in fact, it's probably a bad thing if I were running for office or something, but I'm not. it's just who I am. I've gotten to the point where Flint's various deteriorations and exasperations feel personal. So, what I have to offer the community and this conversation is not a spread sheet; and in the case of the UAH I'm an observer, not a manager of the budget. I'm just a tired schmuck. As a taxpayer I'm delighted that some of my money might be going into that project, blah, blah, blah. 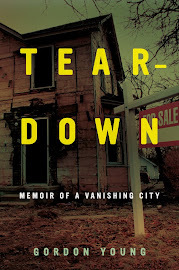 At heart, here's the crux of my comments: I am simply tired of seeing things crumble in my town. I'm famished for actions that make what I see day after day more beautiful. As for the "boring, cost-effective school-building architectual styles," I'm weary of that philosophy of education, too. I think we could do drastically better in how we think about the interplay of architecture and learning...but at the moment,of course, that conversation is a luxury we can scarcely afford, since the Flint schools too are a crumbling mess. Jan and JWilly, your exchange mirrors the conflicting feelings and thoughts I experienced pretty much the entire time I was house hunting and researching my book in Flint. One minute I'd get inspired by signs of hope, only to have them dashed by some reminder of how monumental Flint's problems are. I'd get excited about a house being rehabbed in Carriage Town, then talk to a few residents in Civic Park and realize how much that Carriage Town money could do in another neighborhood. There is such a scarcity of resources that it was really difficult for someone like me — who has such an emotional investment in Flint — to figure out the best way to allocate the meager resources available or to logically evaluate plans to improve the city. One of the happiest moments in my visits to Flint was when I went by my grandparents' old house on the East Side for the first time and it was, remarkably, in perfect condition, still owned by the same person who bought it after my grandma died in 1987. I knew that the entire street might disappear at some point, but it was such a relief to see one place that meant something to me pretty much as it was when I was a kid. Yeah, that's kind of what I was getting at, Gordie, and thanks for your acknowledgements of the conflicting feelings and contradictions and perverse and exasperating difficulties of deciding how to fix things in Flint. My response to jwilly was obviously personal -- and not just personal, but, one could say, selfish -- as was my recent crabbiness about your photo essay (Cinder and Joey say hi, by the way). I want the cello player in the midst of the rubble, the glads in metal cans at the Farmers' Market, the good cappucino at the Crepe Company. Just to keep us going around the rest of our dismay. > I'm famished for actions that make what I see day after day more beautiful. Yep. We're humans...an uplifting environment feeds optimism, and optimism helps a lot of things. Which, notwithstanding the Flint Expats no-politics creed, leads me to a non-partisan-but-very-political comment: we badly need to get back to a decade or so of a roaring near-full-employment economy so that government at all levels can actually begin to be able to afford to do the socially/culturally desirable things we've been putting off for so long. Indeed, JWilly. It's a nice fantasy to imagine. I fear that our days of "roaring" might be over. I hope I'm wrong. The fact is local leadership — especially the school board — has never had the guts to face reality and convey that reality to their constituents. Flint should have looked at the demographic trends 20 or 30 years ago and made the tough decisions about closing schools. The money they would have saved could have gone toward the schools that were picked to stay open. I know this would have been a contentious and emotional process, but that's what public leadership is all about, right? Instead, the city is blowing money slowly closing schools in a haphazard manner that should have been closed years ago, without any real long-term plan. The school board doesn't get a lot of bad press, but it's one of the most incompetent bodies in city government, and that's saying a lot. One corkscrew advantage of closing Central could be that it would avoid discontinuity if somehow money should fall from the sky, or perhaps be provided by the Mott foundations, and a new Flint High School built on the present Central/Whittier site preparatory to closing or re-purposing all of the other upper-school buildings.